Soprano Tracy Cantin will join the Seattle Symphony in 2020 to reprise her acclaimed performance of Bernstein's Songfest​ with conductor Thomas Dausgaard at the helm. Soprano Tracy Cantin will join the BBCSSO as the soprano soloist for Bernstain's Songfest celebrating the American composer's 100th Anniversary year. ​Performances will take place in Edinburgh and Glasgow, conducted by Thomas Dausgaard. Stepping into the title role of Anna Bolena for superstar soprano Sondra Radvanovsky, Tracy Cantin makes an impressive unscheduled debut on May 8 2018 at the Four Seasons Centre. Soprano Tracy Cantin joins [The Richard Bradshaw Amphitheater Free Recital Series] on Tuesday, May 1 at 12 p.m. Joining forces with JUNO-nominated pianist Robert Kortgaard, the duo will present a program that explores a love story in the time of war. Tracy Cantin will join the Vancouver Symphony Orchestra next Spring for a performance of the Immolation Scene from Wagner's Götterdämmerung, conducted by Otto Tausk. The casting has been announced for The Second City and Lyric Opera Chicago's newest collaboration LONGER! LOUDER! WAGNER! Tracy Cantin is thrilled to join the prestigious Second City family for 6 performances of this brand-new 90 minute show. ﻿Soprano Tracy Cantin has been awarded 4th place in the 2016 Licia-Albanese Puccini Foundation Voice Competition. She will have the honour of performing alongside all of this year's award winners at the annual Awards Gala in New York City this upcoming October. 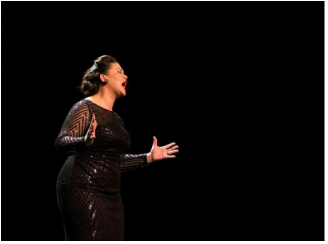 Soprano Tracy Cantin has advanced to the National Semi-Finals as a 1st Place Winner in the Upper Midwest Regional District of the MONC. She will be performing on stage at the Metropolitan Opera in March 2016 in New York City. Soprano Tracy Cantin has been named a 2015 recipient of Canada's prestigious Sylva Gelber Foundation Career Development Grant. This award will help Cantin pursue an audition tour through Europe in the Fall of 2015. Soprano Tracy Cantin has been chosen as one of seven recipients for this year's Sullivan Foundation Award. This award will help to further her career development with 5 consecutive years of continued support. Soprano Tracy Cantin has been named one of one of this year's recipients of the Lieutenant Governor of Alberta Arts Award for Outstanding Emerging Artists. She is the only classical musician to have been chosen for this honor, and is joined by 7 other incredibly talented Canadian artists in​a variety of artistic mediums. ﻿Soprano Tracy Cantin, along with her colleagues in the Ryan Opera Center are featured in this month's edition of Classical Singer Magazine. "For four decades, the prestigious program located in the heart of the Windy City has been credited with helping launch the careers of some of opera’s finest singers, while also attracting some of the most promising up-and-coming vocal talent from around the world." and just the right stoic poise.